France has a lot to offer, from Roman ruins to Renaissance Cathedrals to French cities are rich in culture and history. The historical centres are always really well preserved and will make you feel like you’re going back in time! This 2 weeks in France itinerary will show you the very best history and culture of this intriguing nation. From Roman amphitheatres to 115th-centurychateaus, this 14 day France itinerary is perfect for those travellers who want to explore the fascinating stories of this popular European country. 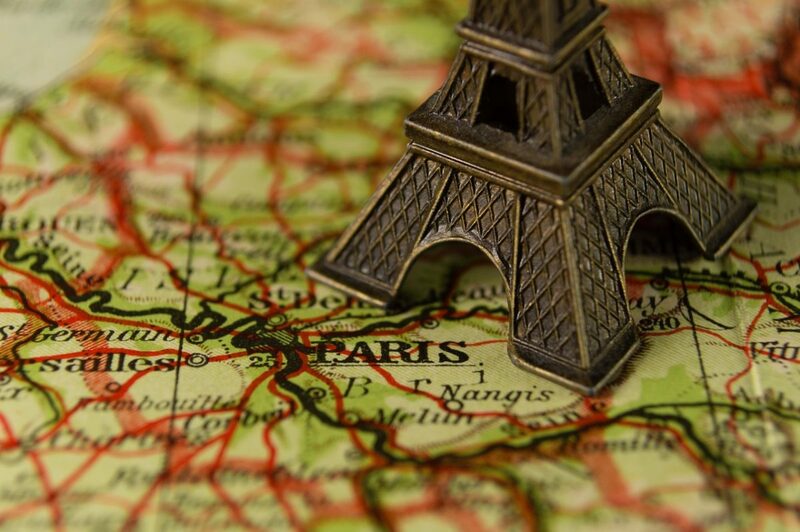 You can start and finish this itinerary from Paris. Use the train to get from one place to another. The TGV tickets are available three months before the departure date. The tickets are usually cheaper then than if you wait. You can also take the bus or carpool, but you’ll lose more time. If you want to do a France road trip, you could rent a car, or drive one over from another European country. 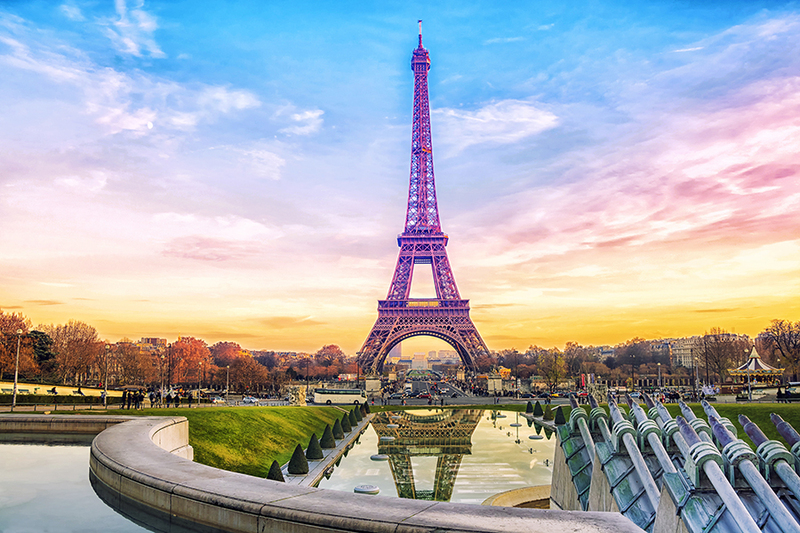 Here is a full Europe itinerary which covers Paris and other major European cities – perfect if you’re having an extended trip in Europe! But for now, let’s focus on the best of France in 2 weeks. While this France itinerary starts in Paris, we’re not going to spend too much time detailing the highlights of this city here. Be sure to check off all the highlights: the Eiffel Tower, Notre Dame, the Champs Elysees and spend some time walking around absorbing the atmosphere. Then head to Caen, the first stop on our historical France itinerary, to begin exploring! 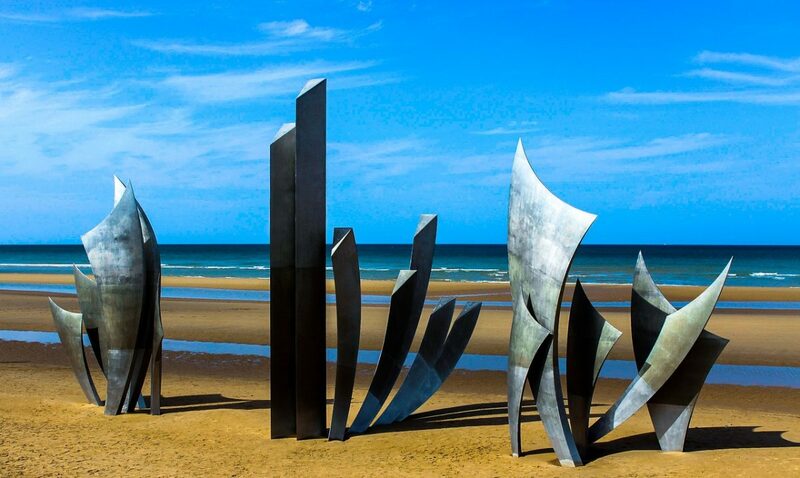 In Caen, you should visit the D-Day Landing Beaches from World War II, where the allied troops landed to free France from the Nazi Occupation. It’s also a great opportunity to discover Normandy’s coastline and the beauty of its landscape. It’s best to rent a car or book a tour, as public transportation is scarce in this area. Check out this best-selling guided tour, which includes the beaches and museum, and lunch. Click here to learn more and book the tour. Back in the city, take a walk downtown, through the medieval paved streets of the Vaugueux quarter. Have a look at the Hôtel d’Escoville, a renaissance building, now serving as the tourism office. Next, visit the Saint-Pierre Church from the 12th century. Then learn all about William the Conqueror by visiting the Abbaye aux Dames and the Abbaye aux Hommes (11th century), and then the Saint-Etienne de Caen Church, where his tomb is. You can also visit the Ducal Castle and its ramparts, one of Europe’s largest medieval fortresses. There are several museums in Caen such as the Musée des Beaux-Arts (fine arts museum) and the Musée de Normandie (retracing Normandy’s culture through the centuries), both located inside the Ducal castle. You can also visit Caen’s WWII memorial. If you have time, you can rent a car and take a day trip to Etretat, famous for its gorgeous white cliffs and rock formations. The landscape there have inspired many impressionist painters. Le Mans is an eclectic town. Here you’ll find almost every type of architectural styles and history from prehistoric times all the way through to the contemporary era. 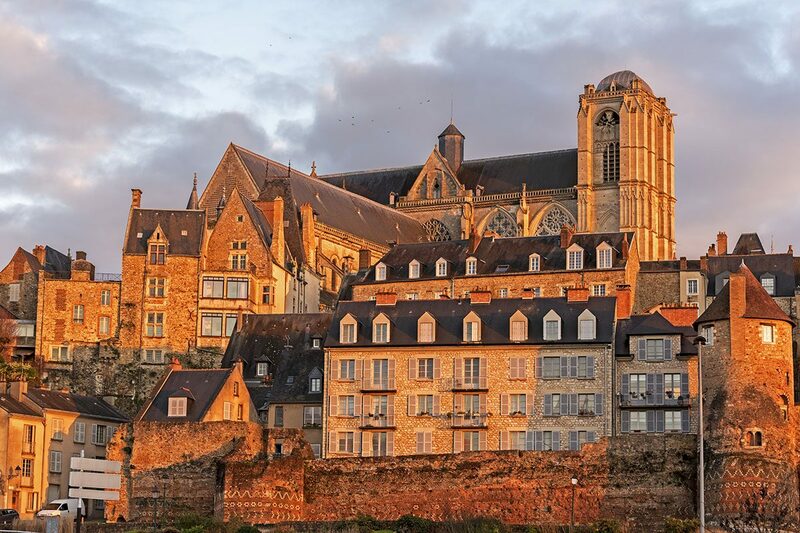 Take a stroll in its historical center (Cité Plantagenêt ) and discover its medieval architecture. Look at the houses and buildings and notice how medieval and renaissance architectural styles are entwined. This part of the city is often used for movies because it has been so well preserved. Check out the Hôtel-Dieu de Coëffort as well. Built in the 12th century, dedicated initially to hosting pilgrims and travelers, it was later turned into a church. Next go to the Saint-Julien Cathedral, which was built during the 11th and 12th centuries and one of the biggest cathedrals in France. In the old Saint-Vincent quarter, visit the Oratoire chapel (Baroque architectural style). Don’t miss the Roman fortified wall, built during the 3rd and the 4th centuries. It’s one of the best-preserved city walls left from the Roman Empire. Amongst other religious sites, you can also visit the Visitation Chapel, the Notre-Dame de La Couture Church, and the Notre-Dame du Pré Church (11th century). Don’t miss the Musée de Tessé, which opened in 1799, and is one of France’s oldest museums. Here you’ll find artworks from the 15th to the 19th centuries, as well as ancient furniture and an Egyptian gallery. You can also go to the Musée de la Reine Bérangère, which is set in three magnificent wooden houses. The museum retraces the history and culture of the area. Le Mans is also famous for its 24 Heures du Mans car race. There’s a museum here that’s dedicated to the events, which features 120 race cars. If the weather is nice, you can visit one of the city many gardens such as the Quinconces des Jacobins, the Parc à Fourrage, or the Jardin des Plantes. Some of the parks were created in the 18th century. If you have one more day, you can visit some of the castles in the area such as the Château du Lude which is still inhabited by the same family since the 18th century. You can also go to the Château Fortress in Sille- Le-Guillaume, but it’s only open to tourists from April to September. One of the city’s culinary specialty is chocolate, so head for the Chocolatier Béline, a world-renowned master-chocolatier, to try this local delicacy. In Tours, roam around the historical city centre. 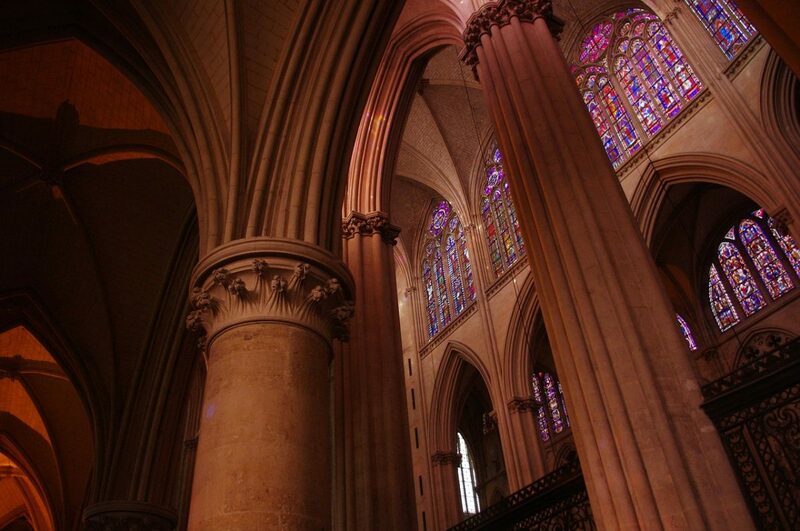 Don’t miss the Saint-Gatien de Tours Cathedral, dedicated to the city’s first Archbishop, Saint-Gatianus. It was built between the 12th and the 16th century. 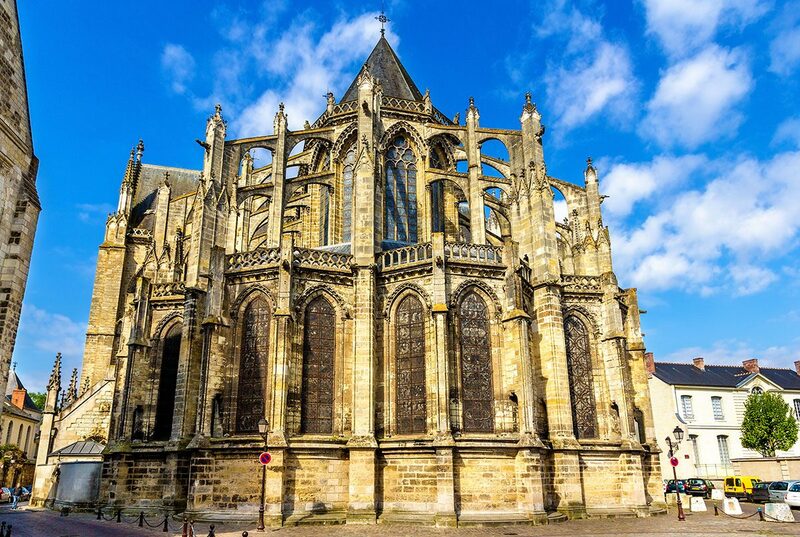 Nearby, check out the Saint-Martin de Tours basilic, home to Saint-Martin’s grave. Most parts of the building are from the 19th century, but the original construction dates back to the 5th century. It’s an important place of pilgrimage for Catholics. In the center, have a look at the Place Plumereau, the Hôtel de Ville and the Hôtel Goüin (one of the few remaining buildings from the Renaissance era). Check out the castle, built on the remains of the antique city. Near the cathedral, you’ll find the city’s Museum of Fine Arts, set up in the old episcopal palace from the 18th century. Its gardens are also worth a stroll. Don’t miss the Musée du Compagnonnage either. Located inside the Saint-Julien Abbey, this museum is part of the UNESCO intangible heritage list. The compagnonnage is a type of non-profit, dating as far back as the Middle Ages; the museum retraces its history. On the next day, you could rent a car or book a tour to visit some of the Loire Renaissance castles and palaces. The most famous one near Tour is the Villandry Castle. Built under François the first reign, it’s one of the last great castles built along the Loire river. 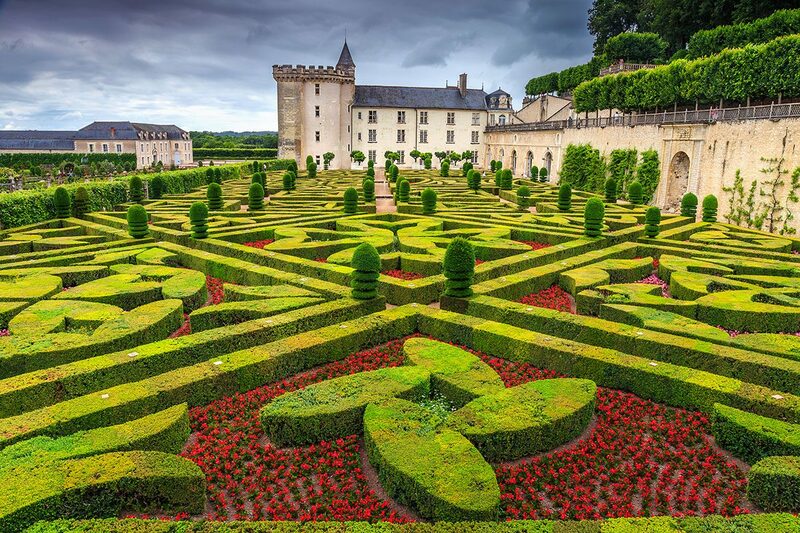 Villandry is also known for its artistic gardens, a true piece of art. You should also try to visit Chambord, only an hour and a half away from Tour, France’s most beautiful castle. There are a few guided tour options for visiting the castles and also the local vineyards. Click here to learn more about a Loire Valley wine tour or, for a tour of the area’s greatest castles, click here. There are also several troglodytes villages in the area; experiencing these is a unique cultural experience. Troglodytes houses are carved out of rocks and are basically cave houses, meant to keep a constant temperature year round of 70°F. Near Tours, you can visit Magnanerie Village which is still inhabited. They organize guided tours and you’ll need to book in advance. Tours will be in French, but they have a paper translation in English. If you want to try a local culinary delicacy sample the Poire Tapée Rivarennes. Pears are cooked using only traditional methods (without electricity or gas), then they are tapées (hit), pressed and dried. You won’t find it at restaurants but they are available in shops. Before you eat them, you’re supposed to rehydrate them with red or sweet white wine, thé or broth. La Rochelle was originally a fishermen’s village, created around the 10th century. It became an important harbor and commercial center a few centuries later. Remains of the city’s rich history can still be seen today. The Vieux-Port (old harbour) was built in the 13th century and is a must-see. It’s now dedicated to pleasure boats and is entirely pedestrian. You can still see the original fortifications and towers. Nearby, visit the three city towers built in the Middle-Ages and get a magnificent view over the city from above. The highest one is the Tour de la Lanterne; the Tour Saint-Nicolas is now a museum, and the Tour de la Chaîne used to be the harbor entrance door. Take a stroll through the historical center of La Rochelle, and admire the ancient houses. Stop by the rue à Arcades, an old merchant street, the Grosse Horloge (city door), the Hôtel de Ville and the Maubec Door. If you like museums, you can visit the Musée Maritime or the Musée du Nouveau Monde, both which detail the city’s history. You can also visit Les Halles, the local covered market. It takes place every morning, but the best days to go are on Wednesdays and Saturdays, when there are most stalls. The tourist office organizes walking tours of the market where you can learn about local products. If you’re in La Rochelle during summer, you can visit one of the nearby beaches such as Chef-en-Baie, Plage de la Concurrence or the Plage des Minines. 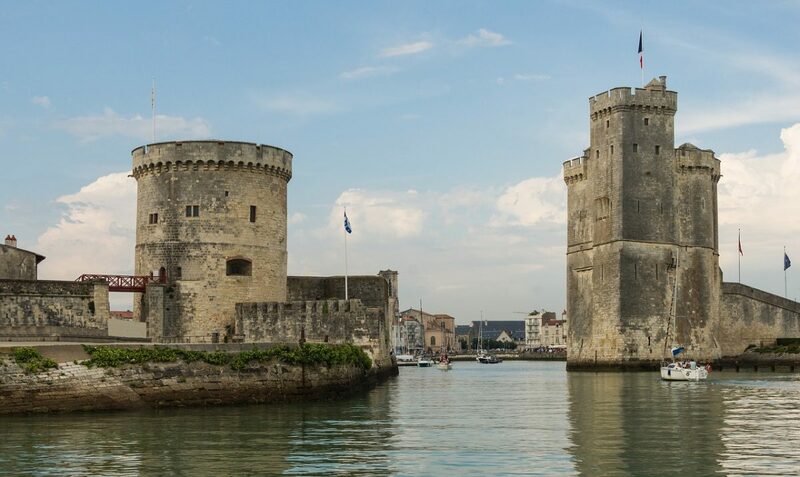 You could also organize a day trip cruising around La Rochelle and the nearby islands – all can be easily sorted in the town itself. If you have a few more days to spare in the area, you could visit either Ile de Ré or Ile d’Oléron, both have great beaches and a layback vibe, but bear in mind that if you go in July or August, it will be packed with tourists. Bordeaux’s history goes back to the Neolithic Era when the first settlers arrived in 56 BC. It later became a Roman city known as Burdigala. It became part of the English Crown in the 12th century, until the 15th century when Charles the 7th reconquered the city. 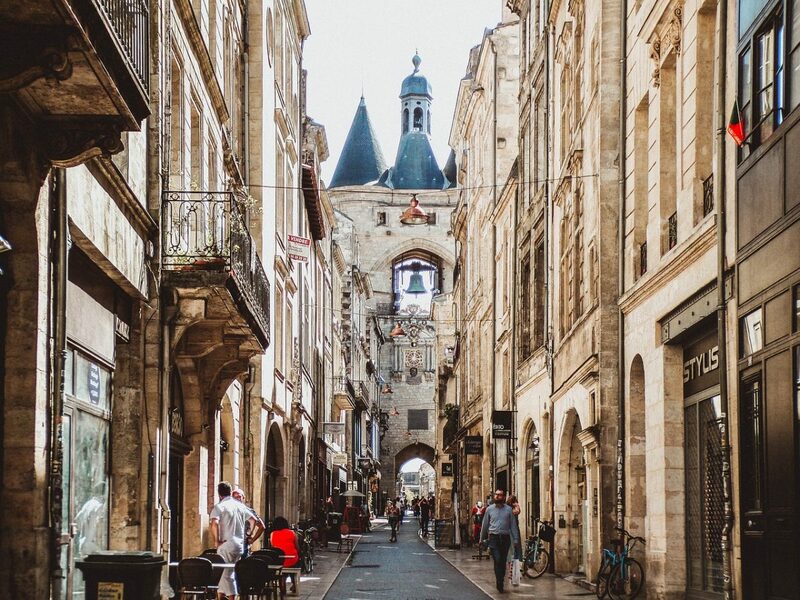 Bordeaux’s rich history has left its marks in the city architecture, something which travellers to France marvel at to this day. In the historical part of town, start with the neoclassical period. Don’t miss the Grand Théâtre, one of Europe’s oldest theatres, and the Cours du Chapeau-Rouge, a pedestrian area that connects the theatre to the city’s docks. 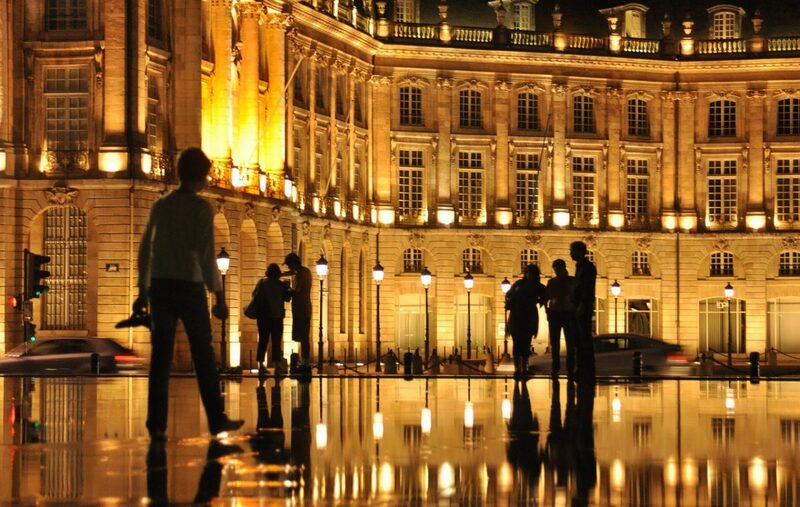 Then head for the Place de la Bourse, where you’ll find the world’s biggest water mirror. Stroll along the quays until you reach the Cailhau Door, which was built in 1494, and enter the Middle-Ages part of the city in the Quartier Saint-Pierre. Have a look at the Grosse Cloche, the Saint-André Cathedral, and the Pey-Berland tower, built between the 12th and 14th centuries. Then, head for the Place Gambetta where you’ll find along the way several mansions from the Renaissance, the Archibishop Palace, and the Rohan Palace, now the City Hall. Another way to visit the city is by boat. You can take a cruise on the Garonne river and see most of the city’s sights. You should also visit the Musée d’Aquitaine. This Museum retraces the history of the Aquitaine region from the Pre-History to the 18th century. Another museum you can visit is the CAPC, one of the best museums in France for Contemporary Art. great beer garden just in front of the Garonne river, and France’s biggest organic restaurant: Le Magasin Général. Try their vegan burger here, it’s delicious! A must-see near Bordeaux, and something to do on your second day in the city, is the Dune du Pilat. This 3 kilometre-long dune is boarded by the Atlantic Ocean on one side and by the Landes de Gascogne Forest on the other. 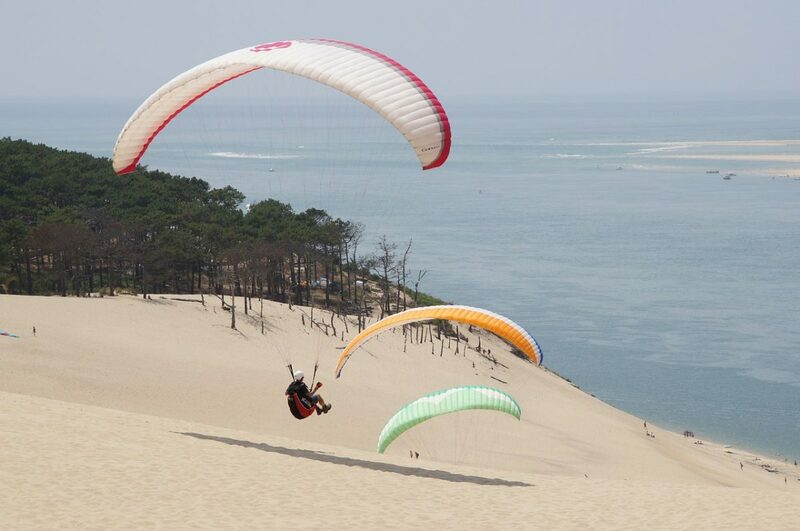 You can do paragliding there or slide along the dune’s slope – or just take some beautiful pictures. If you like wine, you should also book a wine tour to visit the Bordeaux vineyards. Click here to learn more about Bordeaux vineyard tours and to book. If you don’t want to go on a tour, you can visit Saint-Emilion, a cute little village home to one of the best Bordeaux vineyards. You can get there by public transportation so you won’t have to worry about driving later! 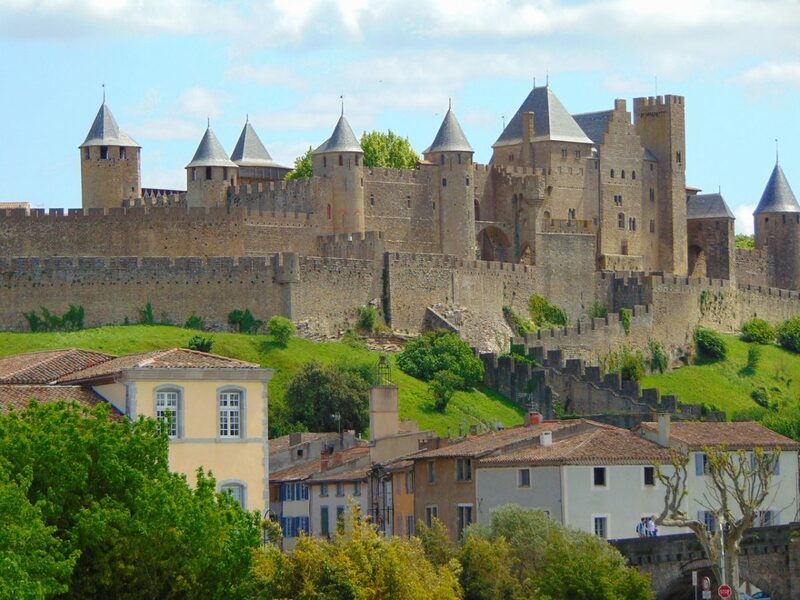 Carcassonne is a medieval fortified city and a UNESCO World Heritage Site; without a doubt one of the most historical and beautiful places that you’ll visit on your France itinerary. It has been left practically untouched for centuries even though people still live here. It’s Europe’s largest medieval city with its city walls still intact. It’s also a great base-camp to explore the nearby Cathar Castles. Here you can stroll around the city paved streets and visit the castle from the 12th century, walk along the ramparts and shop for local crafts. Outside the fortified city, you can pay a visit to the Canal du Midi, also a UNESCO World Heritage Site. The canal was built in the 17th century to link the Mediterranean to the Atlantic. You can either walk along the bank or take a river cruise. Nearby Carcassonne, you can visit the Chateaux de Lastours, four Cathar castles in ruins from the 11th century. Close to them, you’ll find the Grotte de Limoussis, a vast cave system where you’ll see an underground lake, enormous stalactites, and claw marks from Paleolithic bears. 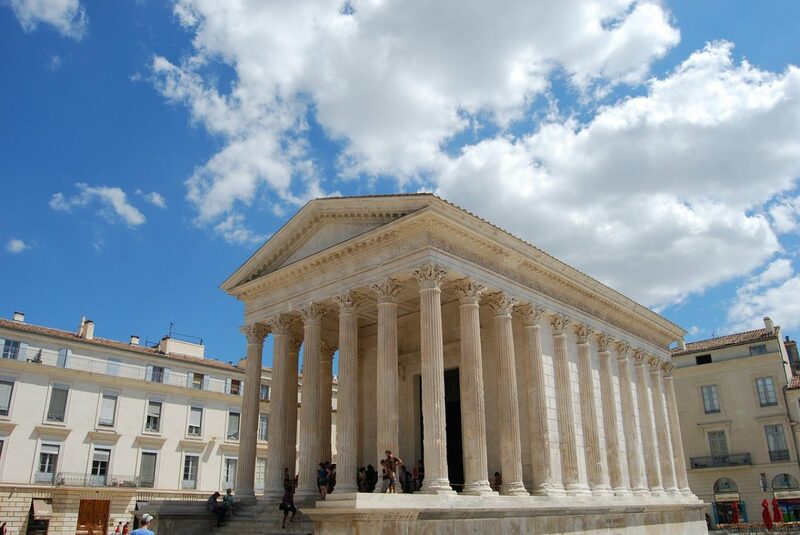 Nîmes used to be an important Roman outpost and is famous for its well-preserved monuments from the Roman Empire era. 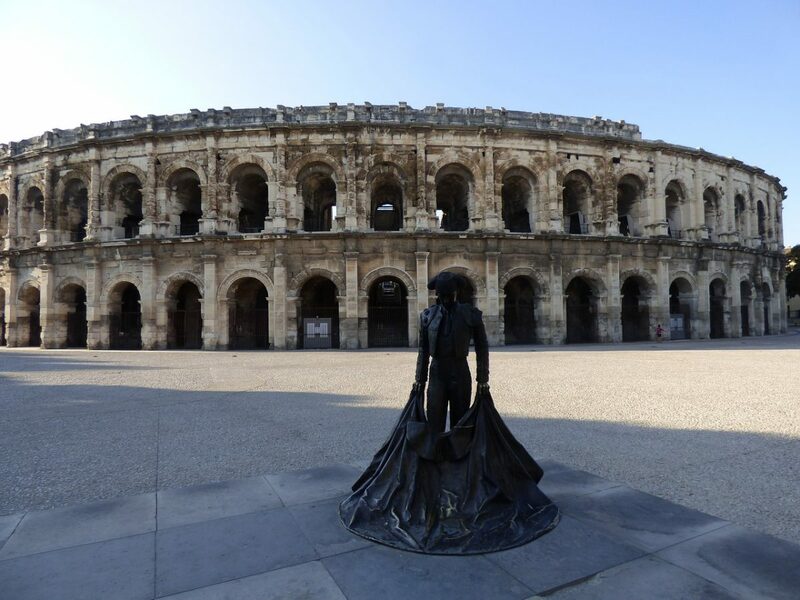 Nîmes’ most famous attraction is its arenas, a Roman amphitheater built around the end of the 1ft century. Around it, the city has architecture from the Middle-Ages up to the 19th century. The Arenas often host concerts, shows and sometimes Roman games. You can also visit the Maison Carrée. This was originally a Roman temple dedicated to Augustus’s two grandsons: Lucius Caesar and Caius Julius Caesar. It later became a consular house, a church and then a museum. Right in front of the temple, you’ll find the Carré d’Art; a huge building (most of it is underground) dedicated to Modern Art. Afterwards, go for a stroll at Jardins de la Fontaine. This beautiful garden is home to two major ancient monuments: the Diana Temple and the Magne Tower. Nearby, you’ll find parts of the Via Domitia, at the Augustus and France Doors. 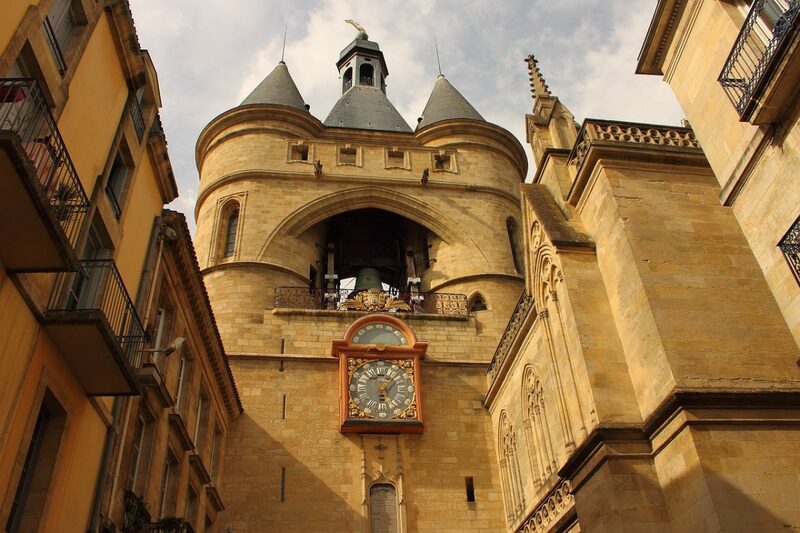 In the historic centre, you’ll also find the Tour de l’Horloge (clock tower). This 100 ft high tower is famous for its wrought iron bell. It was built in the 18th century. Also have a look at the Castellum Aquae, which contained the water from the aqueduct. This basin used to fill the city’s fountains, and the excess water served to purify the sewers. You can also have a look at the city’s covered market to discover the local delicacies. Nîmes is known for its olives and strawberries. 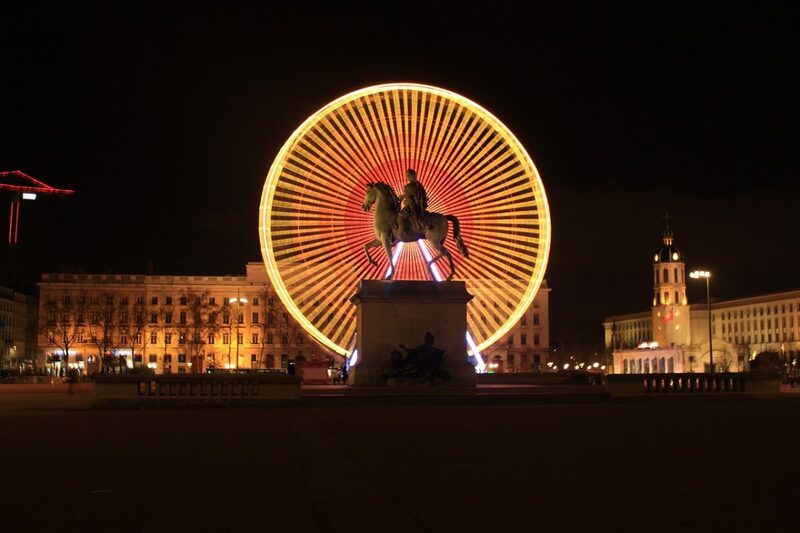 Lyon was founded in 43 BC by the Romans, it later became the capital of Gaulle and an important trading city. During the Renaissance, Lyon became Europe’s financial capital and an important cultural center. Today, its historic center has been well-preserved and is a UNESCO World Heritage Site. Start your visit with the Vieux Lyon and don’t hesitate to get lost in the small streets. Visit the Place Saint-Jean and its Cathedral from the 15th century (traces of older religious buildings from the 4th century have been found there). Nearby you can have a look at the Maison du Chamarier and the Maison des Avocats. Lyon is famous for its Traboules, passageways through buildings. The longest one is called the longue traboule and starts at the 54 Rue Saint-Jean. A bit further, have a look at the Fourvière Basilica. 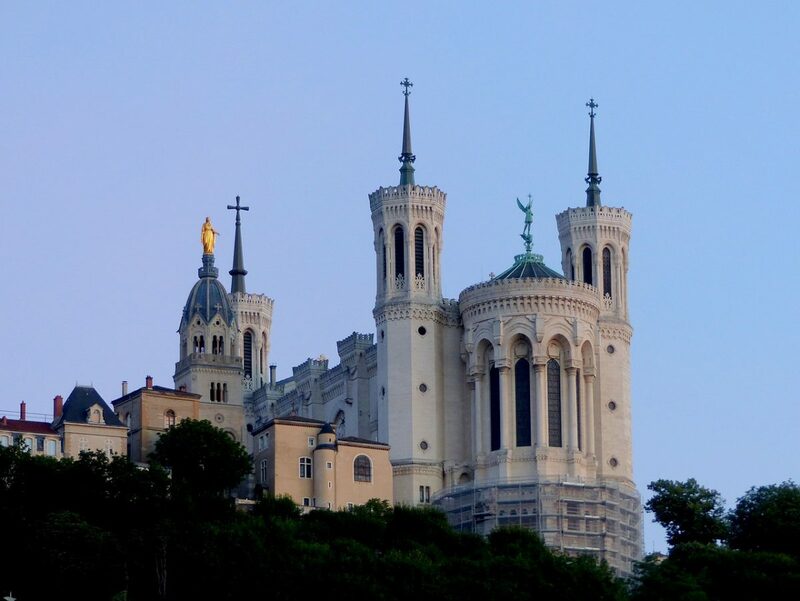 Built in the Neo-Gothic style, it’s the most visited sight in Lyon. Nearby, there’s a Gallo-Roman archeological site with a museum. Lyon is also known for its street art and murals. 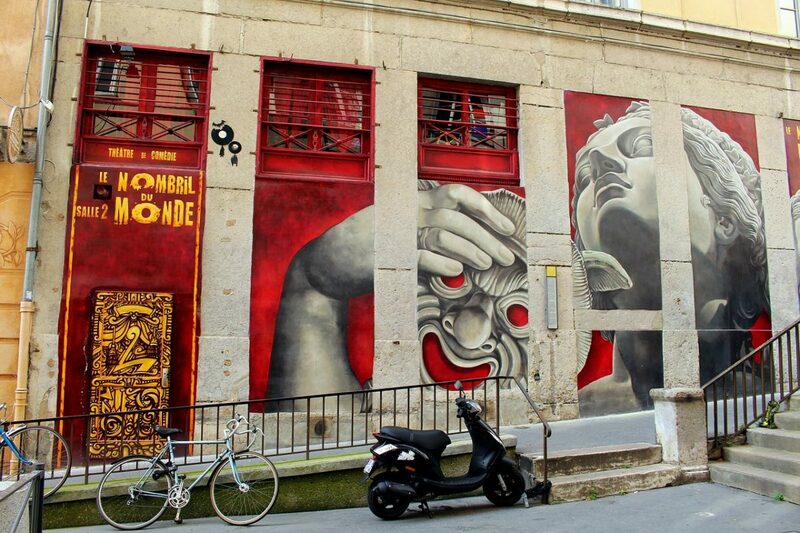 The most famous one is the Fresque des Lyonnais (49 Quai Saint-Vincent ) depicting Lyon’s historical figures. You’ll find most murals in the Quartier des Américains. There are a couple of great museums in Lyon, these are: L’institut Lumière which retraces the history of cinema and The Musée des Tissus et des Arts Décoratifs which exhibits ancient fabric and antique furniture. It’s also worth checking out the Croix Rousse quarter; here you can visit the Maison des Canuts which retraces the city’s silk history and the Maison Brunet, also known as the 365 windows house. There’s also a Gallo-Roman site here, called the Trois Gaules Amphitheater. If you’re in Lyon in December, try to be there during the Light Festival (usually from the 8th to the 12th); the light-shows transform all the buildings into magnificent pieces of art. If you have time, you could take a day-trip to Pérouges, an ancient medieval city. Traces of civilization in Pérouges have been found dating back to 2500 BC. The first written mentions of the city date back to the 12th century, first as only a castle, but the city is documented to have developed between the 13th and 15th centuries. It became a small village and an important stop on the Geneve-Lyon trading route. Due to the revolution then the industrialization period, the town was left with one family inhabiting it at the beginning of the 20th century. Later, important renovation work started and the village became a movie set for several productions and tourist attraction. Today, it’s a nice place for a stroll through the paved streets gazing at centuries-old houses. The tourism office often organizes reenactment and thematic guided tours. You’ll also find a lot of traditional shops. 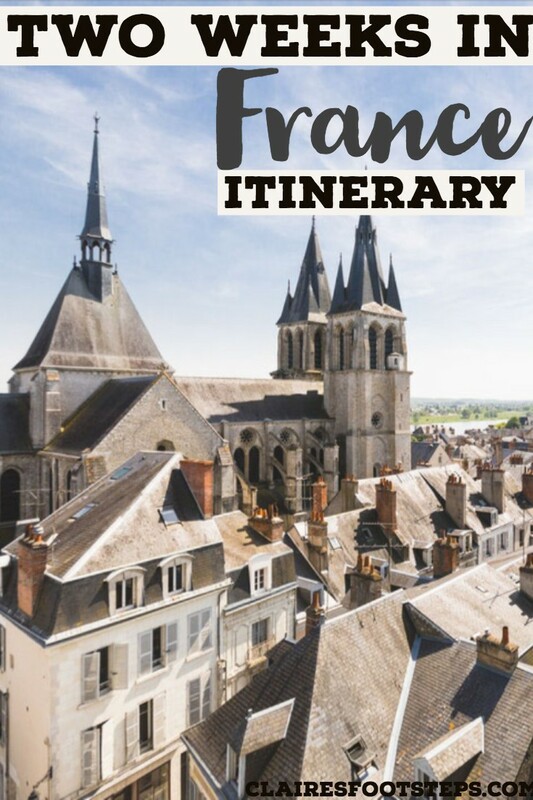 A Lonely Planet France guidebook – click here to purchase. A French Phrasebook (a lot of people in France don’t speak English) – click here to buy one. A reusable water bottle – water is safe to drink in France. Purchase one here. Metal straws – for cocktails and other drinks – say pas de paille s’il vous plait to ensure that your drink does not come with a straw. Click here to purchase some metal straws. 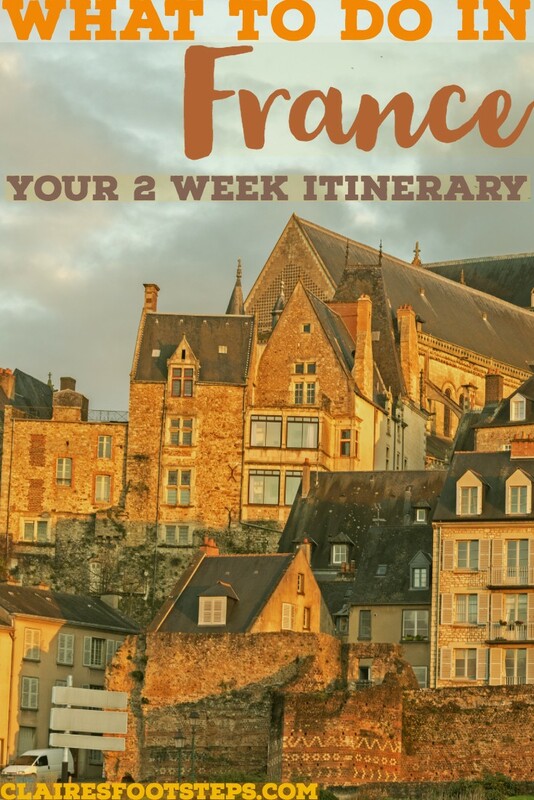 France is a large country and there is always more you can see, but this 2 weeks in France itinerary is great to explore the highlights of the nation’s history. Come back and let us know what your favourite stop on this itinerary is! Julie has been traveling full time since 2016 and is always on the lookout for great destinations and travel hacks. She shares her best travel experiences on her blog Julie Around the Globe and aims to inspire others to travel more and to places less known. You can follow her adventures on her blog and Instagram.